"Pontoppidan" redirects here. For the famous realist writer and Nobel Laureate, see Henrik Pontoppidan. Erik Pontoppidan (August 24, 1698 – December 20, 1764) was a Danish author, bishop, historian and antiquary. He was educated in Fredericia (1716–18), after which he was a private tutor in Norway, and then studied in Holland, and in London and Oxford, England. 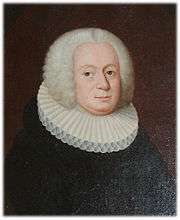 In 1721 he became informator of Frederick Carl of Carlstein (later duke of Plön), and two years later morning preacher in the castle and afternoon preacher in Nordborg. From 1726 to 1734 he was pastor at Hagenberg, where he so protected the pietists as to find it advisable to defend his course against the Lutherans with Dialogus; oder Unterredung Severi, Sinceri, und Simplicis von der Religion and Reinheit der Lehre (1726) and Heller Glaubensspiegel (1727). During this same period he laid the foundation of his later topographical and historical works in Memoria Hafniæ (1729); Theatrum Daniæ (1736); and Kurzgefasste Reformationshistorie der dänischen Kirche. Pontoppidan became successively pastor in Hillerød and castle preacher in Frederiksborg (1734), Danish court preacher at Copenhagen (1735), professor extraordinary of theology at the University (1738), and a member of the mission board (1740), meanwhile writing his Everriculum fermenti veteris (1736) and Böse Sprichwörter (1739). In 1736 Pontoppidan was directed by royal rescript to prepare an explanation of the catechism and a new hymnal, and through these two works — Wahrheit zur Gottesfurcht (1737) and the hymnbook (1740) — the pietistic cause in Denmark received powerful assistance. He likewise continued his historical investigations in his Marmora Danica (3 vols., 1739–41; a collection of noteworthy epitaphs and ecclesiastical monuments) and his uncritical Annales ecclesiæ Danicæ (4 vols., 1741–52); and also wrote a novel, Menoza (3 vols., 1742–43), a critique of the religious conditions of Denmark and other countries. In 1747 he was appointed bishop at Bergen, where he introduced many educational reforms, and wrote Glossarium Norvagicum (1749) and Versuch einer natürlichen Geschichte Norwegens (Copenhagen, 1752–53), while his pastoral letters formed in part the basis of his later Collegium pastorale practicum (1757). The antagonism which Pontoppidan roused at Bergen, however, obliged him to go in 1754 to Copenhagen, where he became prochancellor at the university in the following year. But all his plans in this capacity were thwarted by his opponents, and he sought consolation in writing, the results being his Origines Hafnienses (1760) and the first two parts of his Den danske Atlas (1763–67), of which the last five volumes were edited posthumously. He was also active as a political economist, being the editor of Danmarks og Norges ökonomiske Magazin (8 vols., 1757–64). Pontoppidan argued for the existence of the sea serpent, the kraken and the mermaid in his two-volume work, Versuch einer natürlichen Geschichte Norwegens (The Natural History of Norway), published in 1752 and 1753. He used numerous sighting reports from credible observers to build his case for the existence of these creatures. For example, Pontoppidan used the sworn testimony of a naval officer named Lawrence de Ferry as evidence for the existence of sea serpents. Ferry told Pontoppidan that he had shot a sea serpent while at sea in 1746. After being hit, the creature dived into the water and was gone. Its head resembled a horses' head and it had a mane. It also had coils extending out of the water. The publication of The Natural History of Norway was an important event in the history of the sea serpent in particular. According to cryptozoologist Bernard Heuvelmans, there were only nine dated and documented sightings of sea serpents before the work was published. After publication, there were 23 sightings between 1751 and 1800, 166 sightings between 1801 and 1850, 149 sightings between 1851 and 1900, and 194 sightings between 1901 and 1950. In their book Abominable Science! : Origins of the Yeti, Nessie, and Other Famous Cryptids, Daniel Loxton and Donald Prothero credit this massive increase in sea serpent sightings to the publication of this work and its translation into English. They argue that it provided a cultural template with which people could interpret unusual things they saw in the sea. ↑ Loxton, Daniel; Prothero, Donald R. (2013). Abominable Science! : Origins of the Yeti, Nessie, and Other Famous Cryptids. New York: Columbia University Press. p. 207. ISBN 9780231153201. Wikimedia Commons has media related to Erik Pontoppidan II. "Pontoppidan, Erik". Encyclopædia Britannica (11th ed.). 1911.